Free Subscription: "Microwaves & RF"
Microwaves & RF provides concisely written articles on RF and microwave technology and applications for design engineers and engineering managers working from approximately 10 MHz through millimeter-wave frequencies and optical wavelengths in both analog and digital areas. By submitting this content request, I have legitimate interest in the content and agree that Informa Media, Inc., their partners, and the creators of any other content I have selected may contact me regarding news, products, and services that may be of interest to me. 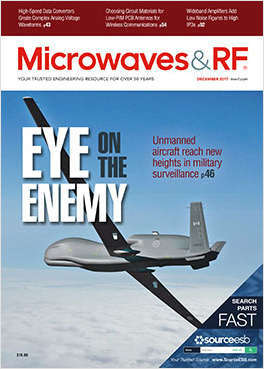 Do you wish to receive a FREE subscription to Microwaves & RF? How would you like to receive your copy of Microwaves & RF? Are you involved with Design/Development projects? Would you like to receive FREE eNewsletters from Microwaves & RF? Cutting edge topics, news, products and technology developments in the microwave industry. With innovations in military research and development continuing to drive microwave and RF technology, we cover the latest in electronic warfare, Wradar, satellite communications, drones, and more. Complete and verifiable information is required in order to receive this subscription. • Geographic Eligibility: USA, Mexico, International. • The publisher determines qualification and reserves the right to limit the number of free subscriptions.